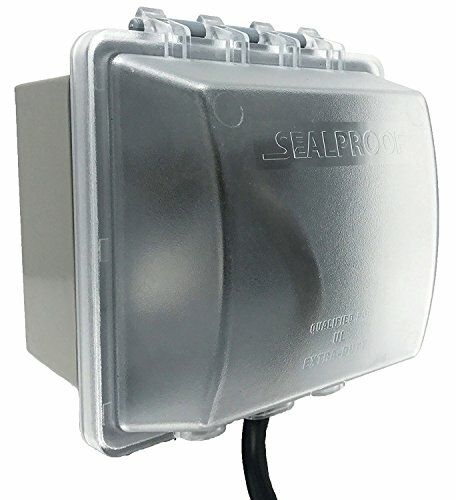 The Sealproof® 2-Gang In Use Weatherproof Electrical Outlet Cover is UL Extra Duty Compliant with a patented multi-configuration design. 1 It is made of a Durable Polycarbonate Construction. Lockable, and easy to install, it is 3-1/4" deep and includes a gasket and mounting hardware. Gang Can be used horizontally or vertically, providing use perfect for up to 45 configurations, whether GFCI, Duplex, Switch or a Round Configuration of 1-1/4", 1-3/8", 1-9/16", 1-5/8", 1-11/16", or 2-1/8".